The San Francisco Giants snapped an 11-game losing streak by beating the Colorado Rockies 2-0 on Friday night. 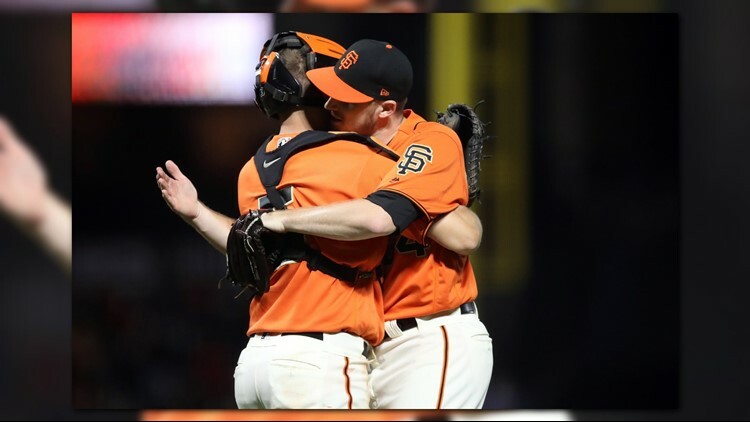 SAN FRANCISCO (AP) - Chris Stratton pitched a two-hitter for his first career shutout, Austin Slater backed him with a two-run single, and the San Francisco Giants snapped an 11-game losing streak by beating the Colorado Rockies 2-0 on Friday night. The NL West-leading Rockies had their division lead trimmed to a half-game over the Los Angeles Dodgers, who won at St. Louis. Colorado had its seven-game winning streak against San Francisco snapped. Stratton (10-9) struck out seven and walked two, throwing 114 pitches to finish the 2-hour, 20-minute game. He allowed only one baserunner to reach second with Trevor Story getting there in the second. The right-hander has a career high in victories and became the Giants' first pitcher with double-digit wins since 2016 when Johnny Cueto, Madison Bumgarner and Jeff Samardzija got there. Those three star pitchers have dealt with injuries this season. Stratton, who worked with former Giants righty Ryan Vogelsong when sent back down to Triple-A Sacramento and will be a contender for the rotation in 2019, retired nine straight during one stretch then his final 12 batters. He pitched the first Giants' shutout since Samardzija on Aug. 28, 2017, against San Diego. While ending the longest skid of Bruce Bochy's managerial career - he had a nine-game losing streak with San Diego in 2003 - the Giants earned their first victory this month. The Giants avoided what would have been just the fourth losing streak of 12 or more games in franchise history since 1883. They did so in 1944 with a 13-game skid and also in 1902 and 1900 - all of them while playing in New York. Tyler Anderson (6-9) hasn't won in 12 starts since beating the Giants on July 4, going 0-6 during that span with Colorado posting a 2-10 record during his outings. Anderson's wild pitch in the second put runners on second and third before Slater's single. Anderson then struck out the side in order the next inning. He allowed two runs on seven hits in six innings, struck out six and didn't walk a batter. San Francisco dismissed seventh-year strength and conditioning coach Carl Kochan in what could be the beginning of a series of moves as another losing season winds down. Giants: 1B Brandon Belt exited in the top of the seventh. He is still in serious discomfort with a sore right knee that he said won't be right until he undergoes an offseason arthroscopic "cleanup" procedure - something he also did after the 2015 season and it held up well, he said. ... SS Brandon Crawford is encouraged his sore left knee has made progress the past four or five days. "Hopefully finish strong," he said. ... 3B Pablo Sandoval, recovering from right hamstring surgery, is happy to be back around the team. He's doing cardio work in his rehab for now, not yet able to lift weights yet. "I feel great," he said. Sandoval hopes to be fully ready by spring training. Rockies: RHP German Marquez (12-9, 3.94 ERA) is on a run of nine straight quality starts, Colorado's longest streak since Ubaldo Jimenez had a franchise-best 14 straight in 2010. Giants: LHP Bumgarner (5-6, 3.30) hasn't allowed a run in his past 14 innings at home dating to Aug. 7.